You need to revisit and re-review this restaurant. That's what Xavier, my husband, suggested to me last September, when he returned from lunch with a business partner at Bolenius in Amsterdam. Apparently things had changed a lot since our last visits in 2012, when I found the experience at Bolenius underwhelming. 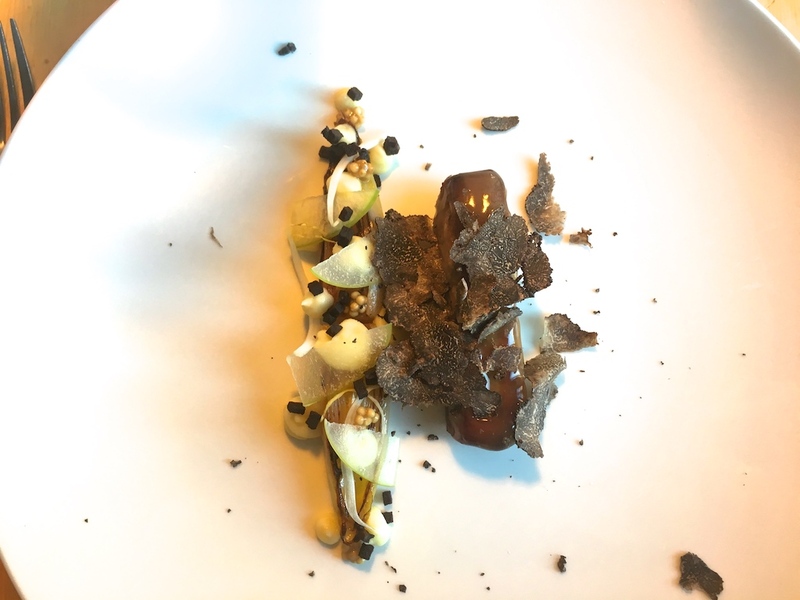 Next thing you know, Bolenius was awarded a Michelin star in the 2017 guide for the Netherlands. Another good reason to revisit - even if only because I recently find Michelin's choices in the Netherlands highly debatable. 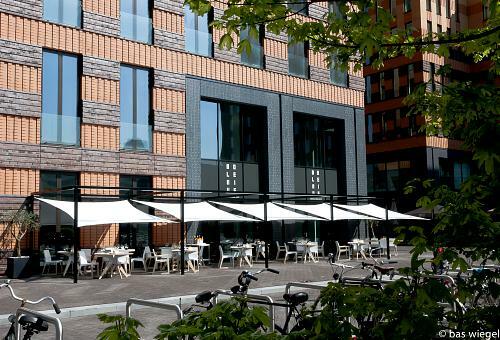 Bolenius is a modern Dutch restaurant located in Amsterdam's financial district "Zuidas". The restaurant opened its doors in 2010 and vegetables have always played an important part in the cuisine. Even so, it is a restaurant that caters for both vegetarians and pescatarians - and good old omnivores too. The restaunt is owned by maître d'hôtel and sommelier Xavier Giesen and head chef Luc Kusters. The latter previously worked in critically acclaimed Dutch restaurants like La Rive at the iconic Amstel Hotel (then one Michelin star) and De Kas in Amsterdam. 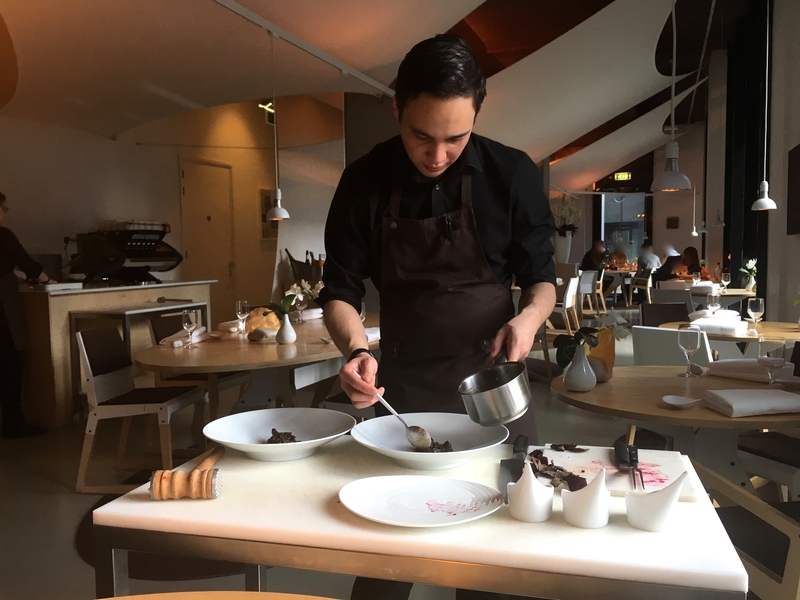 He also worked alongside renowned chef Robert Kranenborg at Le Cirque in Scheveningen (near The Hague, one Michelin star, now closed). Ever since the opening, the restaurant has had its own vegetable garden, which is literally situated among the glass and steel office buildings; a unique asset. 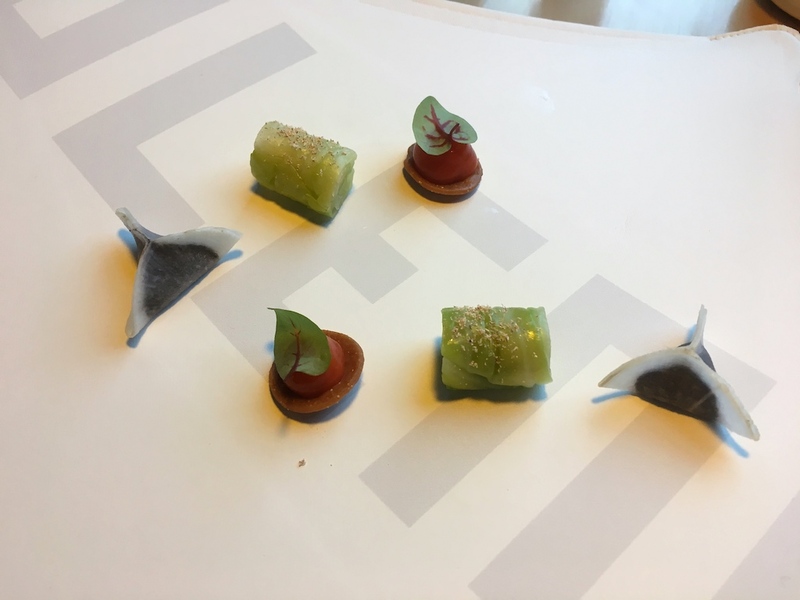 Lunch started with a trio of vegetable nibbles: a pointy cabbage roll seasoned with ground nutmeg; daikon radish filled with a black bean puree; and a semolina cracker with rosehip puree and a sorrel leaf. 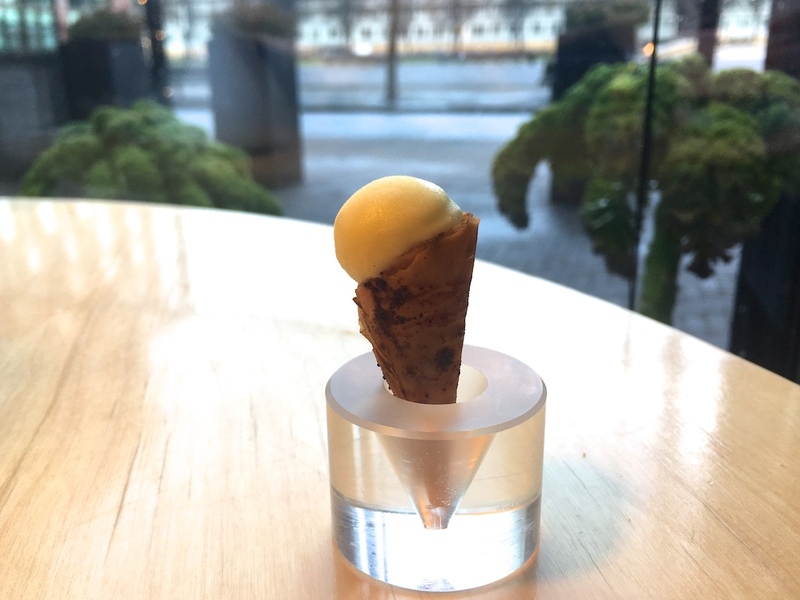 Three delicious bites, which were followed by the restaurant's lovely signature cornetto with "ossenworst" (aged raw beef sausage) and a sorbet of "Amsterdamse uien" (pickled sweet and sour onions coloured with turmeric). 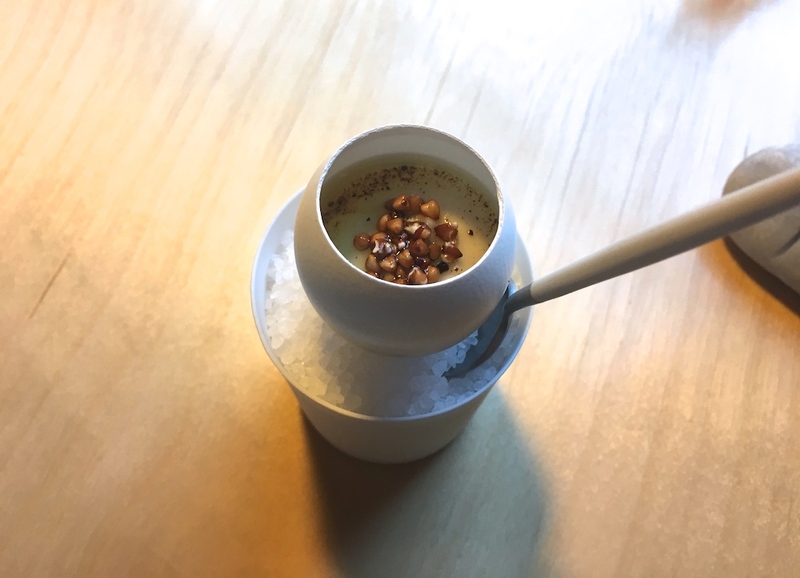 Next to arrive was an egg shell with a soft quail's egg at the bottom, followed by a layer of smooth fermented Jerusalem artichoke puree, and finally some vadouvan oil and toasted buckwheat. 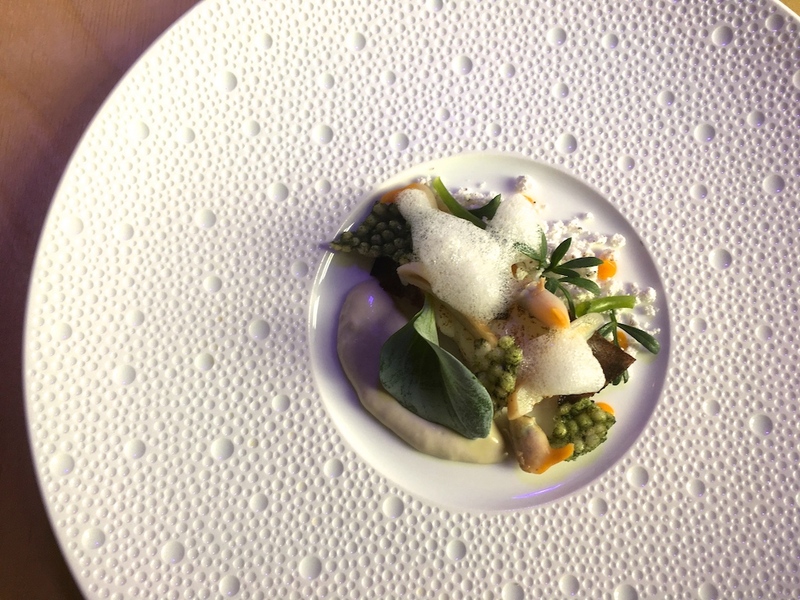 A really lovely flavour combination, the Jerusalem artichoke flavours being elegant but distinctive and the vadouvan oil gave the dish a nice and attractive finish. 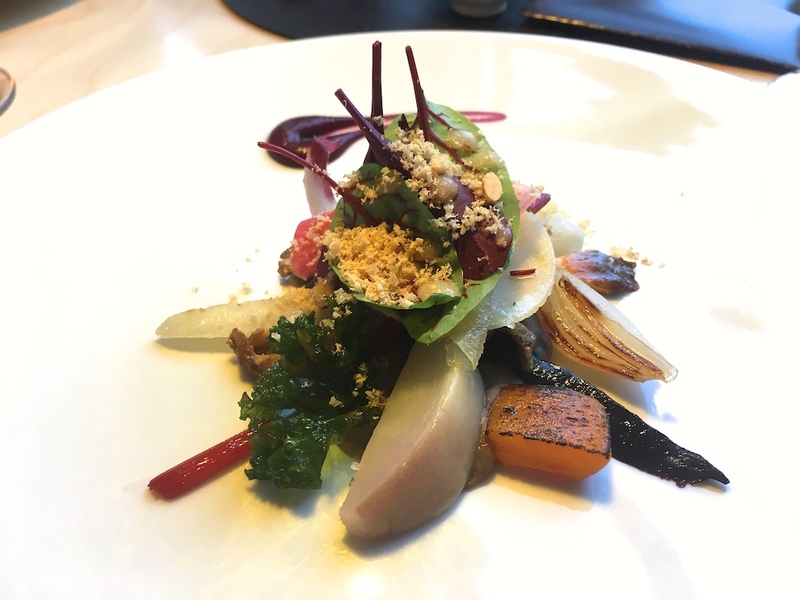 The first course of the Dutch Cuisine menu was called "Moestuin van de Zuidas" - The Zuidas' "vegetable patch", a wonderful selection of cooked, grilled and pickled vegetables from the restaurant's own vegetable patch, garnished with some grated hazelnut. Vegetables included pumpkin, onion, chioggia beets, curly kale, and parsley root. There also was a fruity element: a lovely, sweet and sharp cranberry puree. Best of all though, was a superb lentil puree beautifully seasoned with cardamom, which served as the foundation of the dish. This was followed by flame-grilled langoustine, little blobs of cumin emulsion, thinly sliced crunchy onion rings, red onions, and a sublime celeriac bouillon, that had a nice complexity to it and a gorgeous whisper of smokiness. A delightful pairing with refined flavours, and the addition of the cumin with its lovely nutty and lemony notes, completed the dish. Third course was scallop served with a mini pancake, caramelised onion puree, bacon/hazelnut powder, and curly kale sauce. Beautifully caramelised scallop with just the right medium rare texture, complemented by the bittersweet onion puree. The bacon flavours were a bit nondescript, but the curly kale sauce, on the other hand, had bold and pure flavours, including the characteristic bitters, which provided a nice contrast. On to the fourth course, well-cooked firm and tender cod, accompanied by some sweet and delicate razor clams and cockles, a pungent salted cod foam, sea vegetables, a deliciously fresh and briny oyster cream, and finally some maniguette pepper and bacon powder. A well-executed dish, offering various levels of saltiness/brininess, and a nice extra, subtle seasoning coming from the pepper and bacon powder. The meat course today was a creative and original dish of slow-cooked, meltingly tender blade steak, covered with a thin layer of jelly made from the cooking juices, and garnished with freshly shaved winter truffle. Also on the plate was some soft chicory cooked in beer. The chicory was garnished with diced and crisp blood sausage, mustard seeds, and the individual ingredients of the Dutch classic "Hete Bliksem", namely potato mash, thinly sliced apple and onions. A lovely flavour journey and the chicory balanced the richness of the blade perfectly. 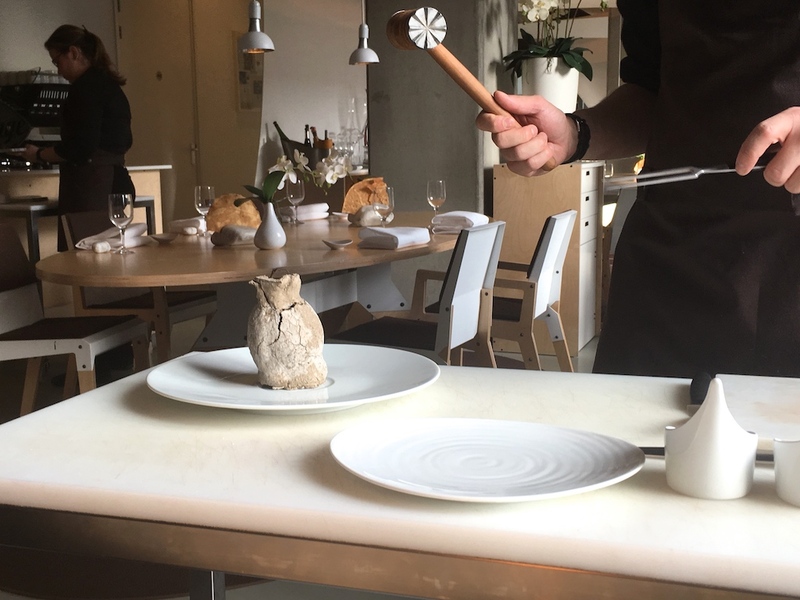 Highlight of the meal was the main course of clay baked beetroot (dismantled tableside), fabulously paired with with a rich but refined morel mushroom jus, meaty (rehydrated?) 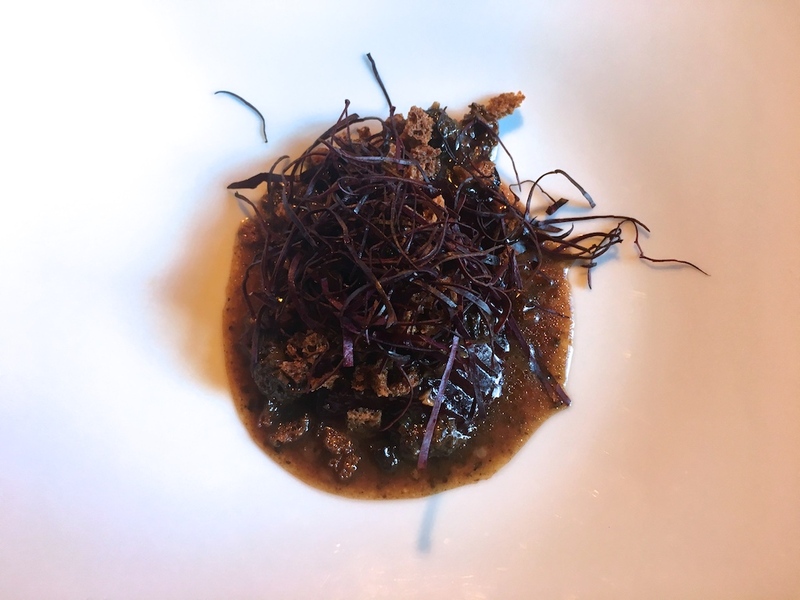 morel mushrooms, crunchy sourdough croutons, and shredded beet leaf. It's well known that I'm not a huge fan of beetroot. I just don't like the raw "bite of dirt" side of this vegetable, but if prepared well it's a great ingredient. And at Bolenius it was prepared well, very well indeed. Clay baking beetroot makes it wonderfully mellow and sweet with tons of flavours, capturing the essence of beetroot, and with not a single note of "dirt" to be found. An outstanding dish with wonderful flavours, a terrific texture contrast, and I loved the tableside dismantling and plating. 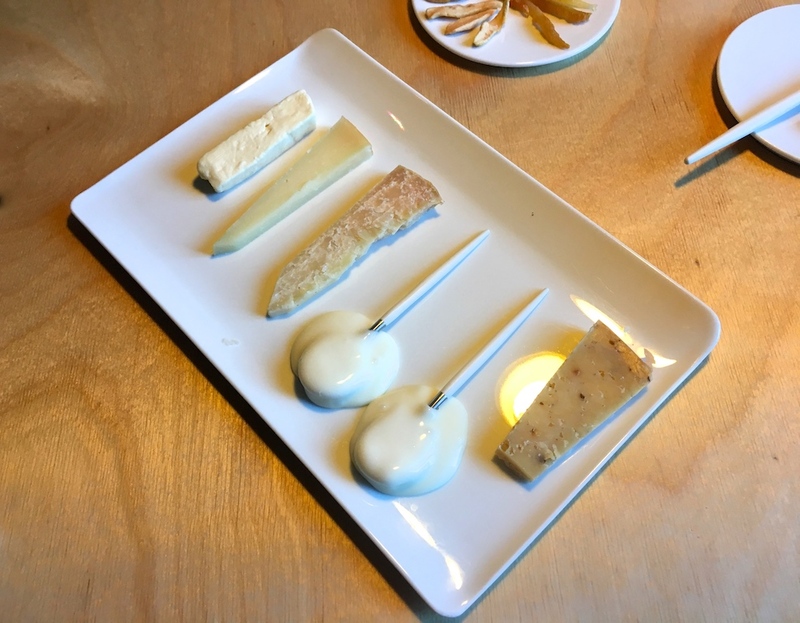 Next we shared a cheese plate, selected from Bolenius' excellent, all-Dutch cheese trolley, including a perfectly creamy and runny "Skeaps Ronde" cheese (on the spoons) from the Dikhoeve farm in Ransdorp (near Amsterdam). 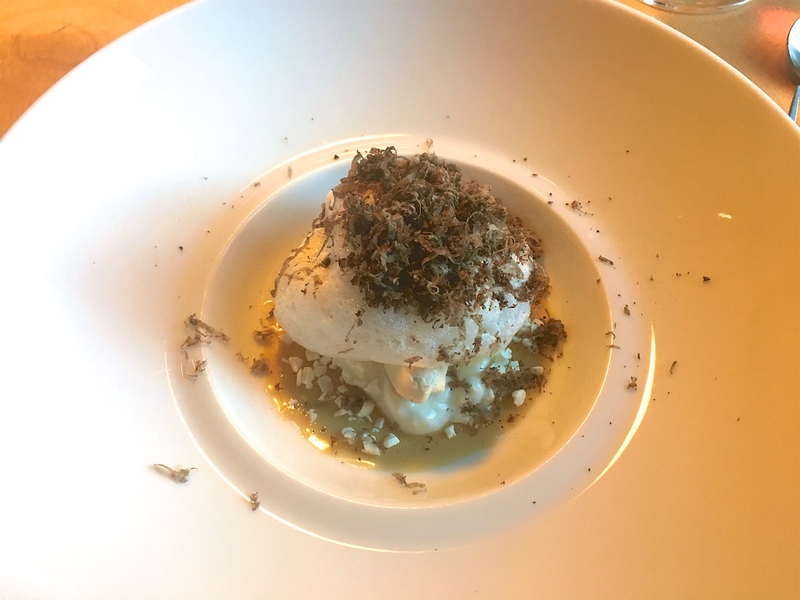 Dessert was described as "5 x lactose", a very pleasing combination of beurre noisette ice cream, smoked milk foam, freeze-dried yoghurt bits, goat's quark, caramelised condensed milk, garnished with freshly grated truffle. Not a blast of sugar, but a balanced sweet dessert with just the right level of savouriness. 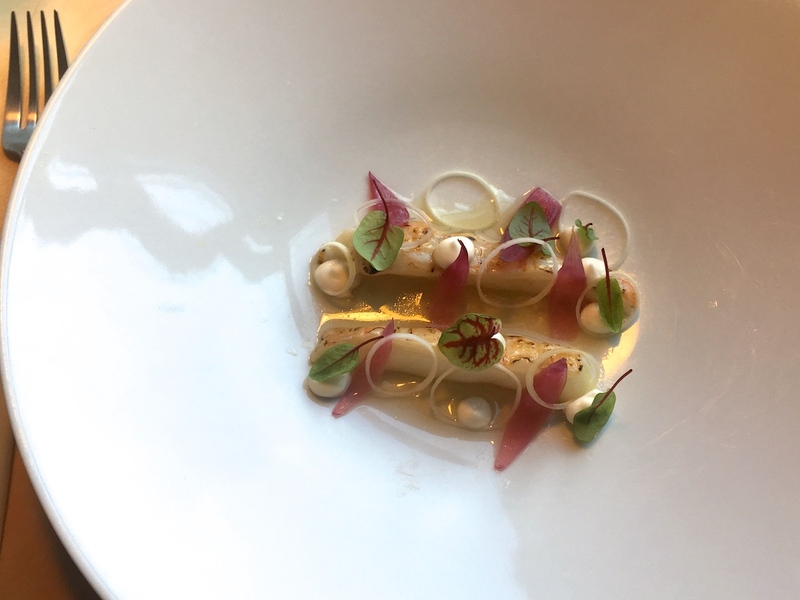 It is clear that the cooking at Bolenius has evolved significantly in the last couple of years. Whilst retaining its original ethos and theme, it has become much more accomplished and sophisticated. 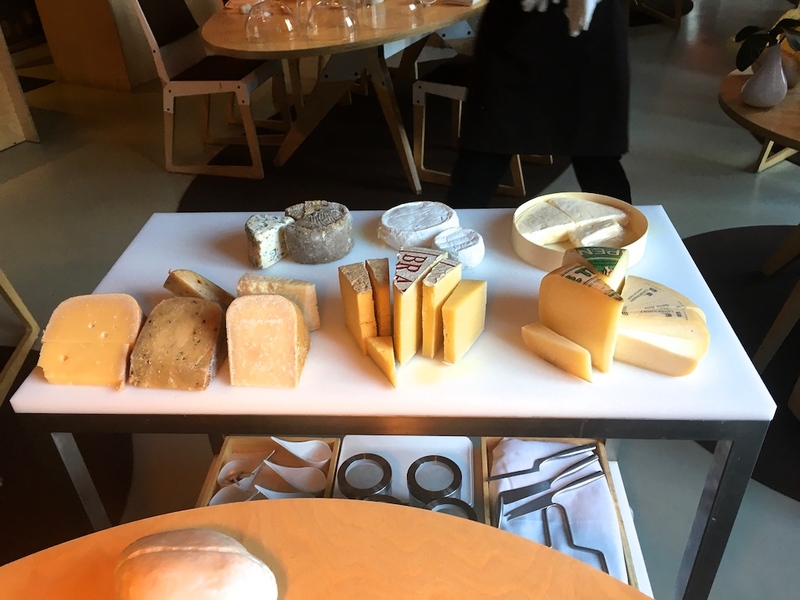 There is attention to detail (both food and service), the choice of ingredients is interesting and they are handled with creativity, care and skill. 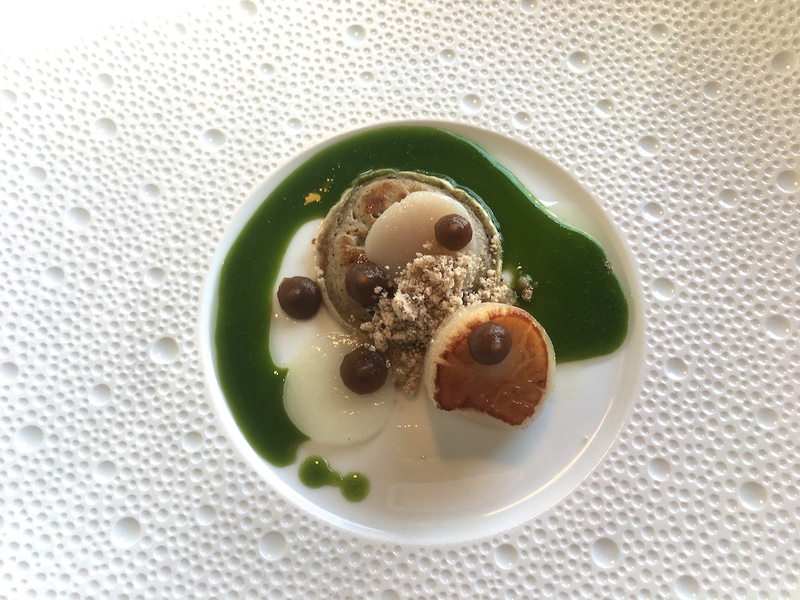 The cuisine delivers a good balance between simplicity and complexity and above all an individual style which clearly distinguishes Bolenius in the Dutch culinary landscape. 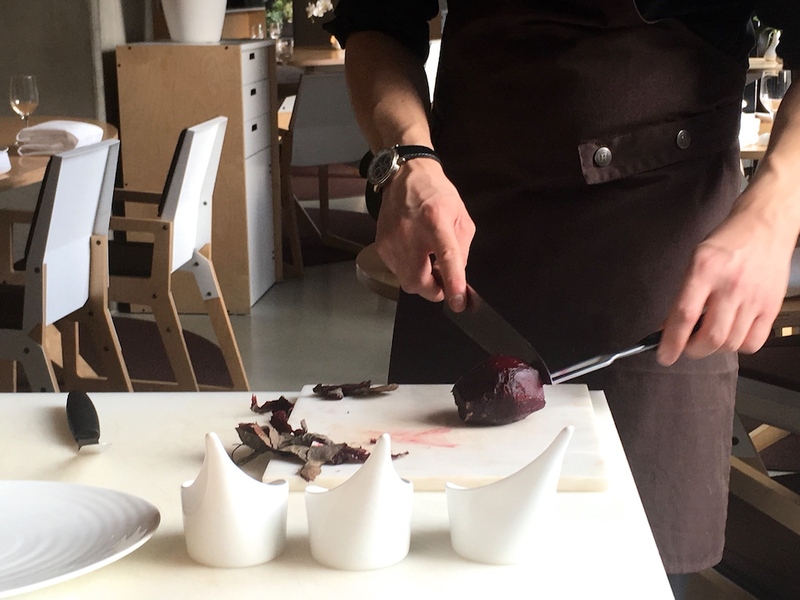 Lately I have sometimes been puzzled by the choices of the Michelin Benelux team, but this time they hit the clay-baked beetroot on the head.